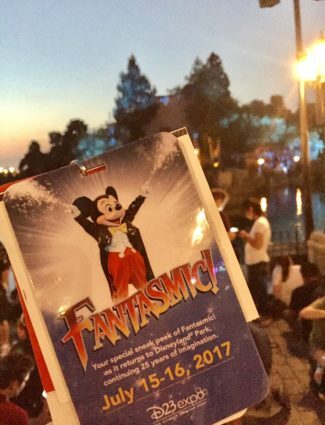 “Fantasmic!”, the popular Disneyland nighttime spectacular based on an adventure through Mickey Mouse’s imagination, returns to the Rivers of America on Monday night after a long hiatus during the rerouting of the river for Star Wars Land construction. The new show soft opened on Saturday night for those who were attending the D23 Expo this weekend and were inside of the Parks and Resorts Presentation. Luckily I was in that group so I can bring you a review of the new “Fantasmic!” show before it officially opens Monday. To preface this review, I had fantastic seats for the new show. I was right in the middle section dead center looking directly at the main stage of the show on Tom Sawyer’s Island. I will not be able to very well judge how the new projections play if you are sitting off center on the Rivers of America. One quick side comment: If you purchase a Disneyland 3 day park hopper from Get Away Today before Monday night, you will receive $19 off your ticket on top of the already steep discount. Must book through this link for discount. 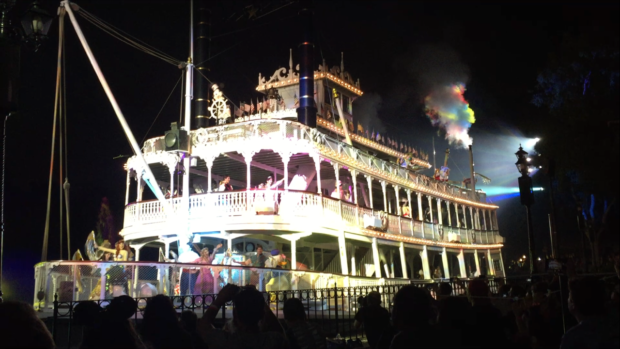 What didn’t change in “Fantasmic!”? 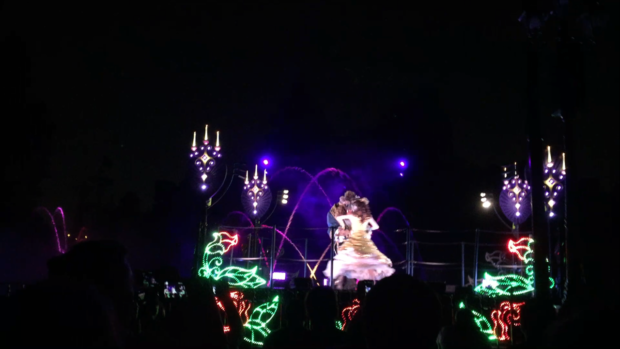 The new “Fantasmic!” show kept the heart of the show almost identical to the original version. The show is still telling the same story that takes you head first into Mickey Mouse’s imagination. You will still feel the same sense of excitement and swell with emotion throughout as the show builds its energy levels in almost identical patterns. That is, the overall structure and layout of the show is basically the same. Segments were tweaked here and there and new intellectual property was added, but the show remains built around the same main blocks of content. This means you don’t have to worry about your favorite opening and closing numbers changing too much with this update. You can see the new closing act including the dragon here. When I first arrived at the Rivers of America for my viewing I was immediately struck by a large brown tarp that was hung behind the shack on Tom Sawyer’s Island where much of the action for the show takes place. This tarp stretched up almost all the way to the tops of the trees on either side. Once the show started, I saw that this surface was being used to increase the area that they were able to project onto. Each segment was enhanced by new projections. This was a very nice added layer that will increase the amount of times you can watch and always see something new. The music seemed much more substantial with a richer audio recording that must have resulted from a full new orchestral recording or remastering. The sound is a little different, but nice. From the opening to the close, Mickey Mouse was inserted into many more scenes so that he was traveling through the entire adventure with you. Even when there was no physical Mickey Mouse actor, he would appear in the projections. New characters were added into segments in many different areas of the show. The Lion King was added into the jungle type segment with the dancing monkeys. Aladdin was added with Genie doing the “Friend Like Me” number and “Whole New World” with a flying carpet opening the princess segment. In the princess segment, Snow White was replaced by Rapunzel and Flynn Rider from Tangled. The second half of the show starting off with the villains sequence remained largely untouched hold for better technology that only enhanced the show. One such addition made the dragon each cooler. Right as the dragon is being defeated by Mickey Mouse, it rears up its head and shoots a huge burst of flame up into the sky. It is nothing short of epic! The only extremely jarring and potentially negative change to the show was the replacement of Peter Pan with Pirates of the Caribbean. The segment functions the same way with the Sailing Ship Columbia being transformed into the Black Pearl with Jack Sparrow and Elizabeth Swan battling pirates in the same way that Peter Pan and Wendy did. Originally this new segment was planned to have projections and digital mapping on the actors themselves, but, during the performance I saw, these projections were not present. The segment was basically equal to Peter Pan in my mind, which I would then say means they should have left it as Peter Pan. However, I understand their motivation to change to pirates because of all the large promotion currently happening around that film and the synergy this addition creates. Overall, the new Disneyland “Fantasmic!” is a wonderful show that has been freshened up and enhanced beautifully. The changes make the show even more relevant for the current landscape of popular Disney characters without hurting the classic storyline and show that we all love. Follow along with more Disneyland by fun liking our Facebook page and subscribing to the email newsletter. Thanks for describing the new Fantasmic. I enjoyed reading.